Their ongoing effort to insure America's undisputed world dominance by having the leaders, politicians, diplomats, military and secret services of foreign countries, friend and foe alike, die of laughter at our ineptitude must be applauded. On a more serious note, as a government, when your national interests are defeated by a 22-year-old confused loser like Bradley Manning and assorted WikiLeaks bozos it is high time to call a time out and reassess you competence. The US embassy cables are marked "Sipdis" – secret internet protocol distribution. They were compiled as part of a programme under which selected dispatches, considered moderately secret but suitable for sharing with other agencies, would be automatically loaded on to secure embassy websites, and linked with the military's Siprnet internet system. They are classified at various levels up to "SECRET NOFORN" [no foreigners]. More than 11,000 are marked secret, while around 9,000 of the cables are marked noforn. The embassies which sent most cables were Ankara, Baghdad, Amman, Kuwait and Tokyo. More than 3 million US government personnel and soldiers, many extremely junior, are cleared to have potential access to this material, even though the cables contain the identities of foreign informants, often sensitive contacts in dictatorial regimes. Some are marked "protect" or "strictly protect". Last spring, 22-year-old intelligence analyst Bradley Manning was charged with leaking many of these cables, along with a gun-camera video of an Apache helicopter crew mistakenly killing two Reuters news agency employees in Baghdad in 2007, which was subsequently posted by WikiLeaks. Manning is facing a court martial. 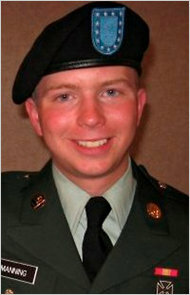 It's rather unfortunate to see how many people are actually saying that Bradley Manning is a traitor, is un-american, etc. Calling Bradley Manning a traitor is like calling Friedrich Olbricht, Henning von Tresckow, and Claus von Stauffenberg traitors. Very clever use of historical traitors! This boy has ruined his life to give people who want to hurt us pages out of the playbooks. He is lucky we do not kill traitors anymore. He should be shot for treason. What people should realize is that he took an oath and signed multiple non-disclosure agreements prior to being given access to the information he had access to...he betrayed his fellow Soldiers....he betrayed the American people....he betrayed his own word. The information is not important..the position he held while leaking that information is what caused and will continue to cause damage to our nations national security. There is absolutely nothing heroic about this traitor. The list posted today of sites we consider vital to national security opens the US up to attacks from every enemy we have in the world, large and small. It means the tiniest terror cell now has a check list of people to kill and sites to blow up that will hurt our nation. It is disgracful that this lowly pfc had access to this info. but far more disgraceful that he violated his oath and put us all at risk. He is a traitor by every definition of the world, and deserves prosecution to the fullest extent of the law. I assume he had accepted that possibility when he decided to do something so heinous and is ready to accept his punishment. I disagree. Yes, what Pfc. Manning did is disgraceful (and, of course, illegal). But for me, the fact that the system we have in place to protect our national security and interests was so easily defeated by someone like him, in all his confused and unsophisticated glory, is orders of magnitude worst. And while I am confident that he will have to answer for his actions, I have serious doubts that those responsible for the systemic failure will ever be held accountable, and that lessons will be learned. Which pretty much leaves us at the mercy of any marginally competent foreign operative. Those that make the most noise "againt" truth are possibly guilty of "something" to hide and should be investigated?Twenty tears back Burke Hedges wrote what is in effect an expose, but he did not have the audiance that Wikileaks has, but supporters of Manning and Assanges crusade for truth integrety, Human Rights. "Who Stole the American Dream?" ISBN 0-9632667-0-5 this is aMUST read and should be reproduced in schools and on the Internet.Who are the Evil Ones. Herod? Pontius Pilot,Constatine?Are we to wait for history to tell us?